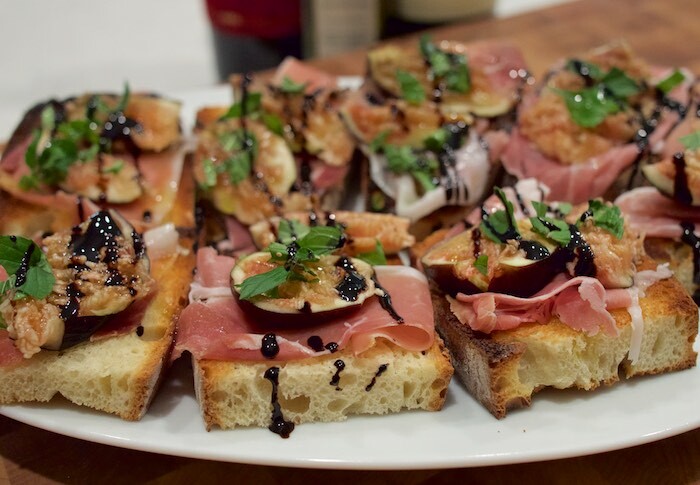 If your looking for an all occasion appetizer that will easily impress any crowd Jamie Oliver's Crostini with Prosciutto, Figs and Mint is the one! Crostini in general are well loved by all; and this version is no exception. Each delicious bite is bursting with flavor and substantial ingredients. Speaking of ingredients; this is not the time to skimp on quality. There are just a handful of components that make up this recipe; so be sure to use best you can find. Imported prosciutto, high caliber balsamic, fresh mint, bread & figs; each is equally important. Grill the bread and while still warm rub them with the cut side of the garlic and drizzle with extra virgin olive oil. Slice the figs in half, then drape a piece of prosciutto over each of your hot crostini and squash a piece of a fig on top. Finish with mint leaves and serve drizzled with a balsamic vinegar. I love all these flavors and they work so well together. Looks delicious! oh Yum! cannot wait to make these - love FIGS! There is nothing better than making a 'meal' with this dish! Love all the flavors, crunch, salty, sweet and more! I am excited to make these for my next party, simple and elegant! !